Users who like to take part in backpacking trips, and spend a few days in the wilderness have to take the basic trekking gear with them. Since a shelter is one of the most important survival necessities, many travelers take a tent with them. There are various models of tents, and the 4-season tents are popular for the all-round campers. Some people climb mountains and need a reliable shelter in a form of winter camping tents, which can withstand wind and frost. While any basic tent, should be good enough for a summer holiday, the backpackers who need to camp during the bad weather or at high altitudes should take the time to select the best 4-season camping tent to suit their needs. Because of a plethora of 4-season camping tents featuring a broad array of features, it becomes a challenge for one to pick the best. It is never easy to have a tent that is an all-in-one. 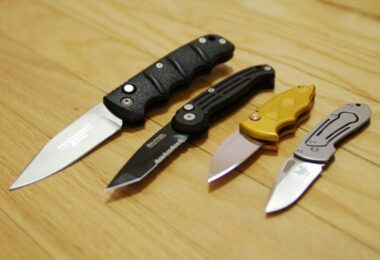 At times you need to compromise or trade-off some of the features in line with what works best for that specific trip. For instance, minimalist may decide to consider a tent without vestibules or pockets just to trim off excess weight. We have provided you a range of the best products on today’s market with the important aspects emphasized. Take a look at the table below to compare some of the features just to get a preview of which one could be the best fit for your excursions. 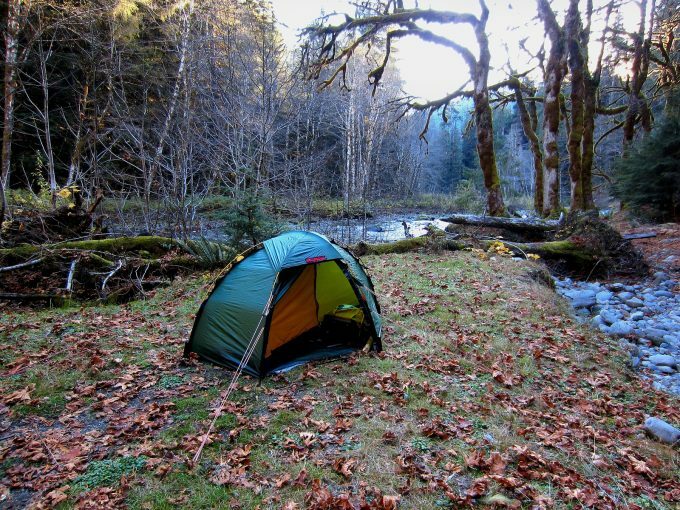 Before we can delve into the reviews of these 4-season tents, we will go through some of the important things to consider before purchasing the best tent. While it would be nice to have a perfect tent for any type of adventure, unfortunately, it’s impossible, as some features are mutually exclusive to a certain degree. Typical tradeoffs involve space or special features vs weight and durability vs price. Before selecting an appropriate model on the market, consider what you want to do with it. As you start considering typical situations encountered during your backpacking adventures, the importance of various features becomes obvious. How much space do you need inside of your tent? While manufacturers suggest the number of people that can stay in their models, these numbers usually tell you only the number of sleeping bags that will fit inside. This could mean that only the basic space necessary for surviving the night is available. Mountaineering tents tend to be especially small as they are built to be lightweight and durable instead. However, campers who plan to fit their whole family in the tent and to spend time socializing in there, need larger models. What about a separate room for parents or putting a dog inside as well? There’s one more issue to consider: how much gear will you keep in the tent? If you plan to put the roof over your camping gear, backpack and tools, you must select a model with spacious vestibules. As people spend nights in a small enclosed space, they need a constant supply of fresh air. This is particularly important during hot, summer nights when the air in any tent quickly gets stuffy. If you don’t want to lie awake drenched in sweat, then select a tent with effective ventilation. The circulation and exchange of air are provided by a set of vents, which let the breeze through. 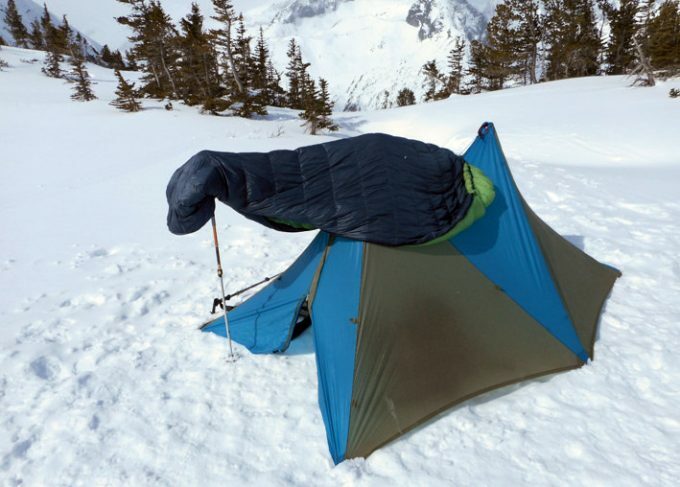 However, during cold spells, the same vents cause fast loss of warmth from an interior of the tent. And during the rainfall, they can let raindrops through, leading to water spills and moisture buildup inside. That’s why it’s best to choose a tent with adjustable vents, which can be opened, covered or closed depending on your needs. Certain models feature two separate layers of materials. This solution ensures an adequate ventilation and insulation while protecting the interior from moisture. However, these tents tend to be quite heavy. Campers who travel by car usually don’t care about the weight of their tent and choose it according to its extra features. Additional layers, vestibule, footprint, and loops or pockets add more weight to the package, but enhance the comfort of travelers and provide more indoor space for campers. 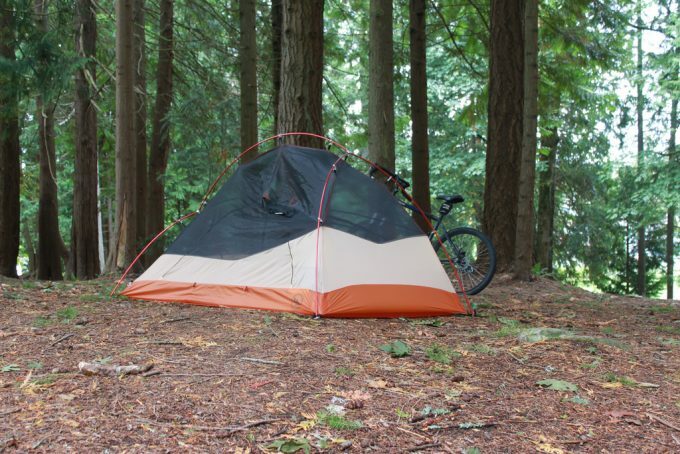 Some people who travel by bike or on foot, usually select a mid-range tent, which is light enough to be carried easily during the trip but still provides sufficient perks and space. However, alpine climbers who like mountaineering in extreme circumstances prefer to cut down on carried weight as much as possible. They usually select a bare-bone model which provides just a safe base to spend the night. Those who need to pack lightweight can use a tent with optional features, such as additional vestibules which can be either left behind during the trekking journey or included in the set during a permanent camp. Meanwhile, those who travel together can share parts of the set between themselves to make it easier to carry. 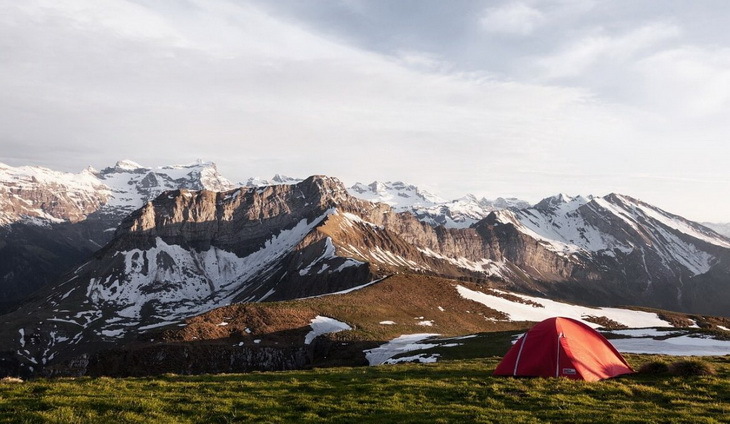 While a tent used during a brief summer trip has to deal just with cool nights and a bit of wind and rain, the one used during winter has to deal with freezes, snowstorms, very low temperatures and powerful winds. You have to select a sufficiently durable model for your purpose to avoid getting stuck in the middle of a wilderness without any shelter. Do your best to avoid the destruction of your fragile tent. Most people believe that the canvas is the weakest spot of the structure. The fabric can get torn, however, zippers are the most frequently damaged part of the tent. The poles should be strong enough to withstand the thick layer of snow and a camper, who could accidentally trip and fall at his tent. While the quality of materials and particular elements matters a lot, the construction of the whole tent is crucial too. A clever design is very strong, but badly placed parts can damage each other instead of providing mutual support. The speed and simplicity of putting up your tent don’t matter much if you plan to spend your holiday at the campsite and live in one place. However, if you need to set up the tent quickly in the challenging weather in order to have a shelter for the night, its design becomes quite relevant. People who will camp in winter should have to put up the tent while wearing gloves and that will limit their manipulation skill. Chilled, partially numb hands add to the difficulty as well. 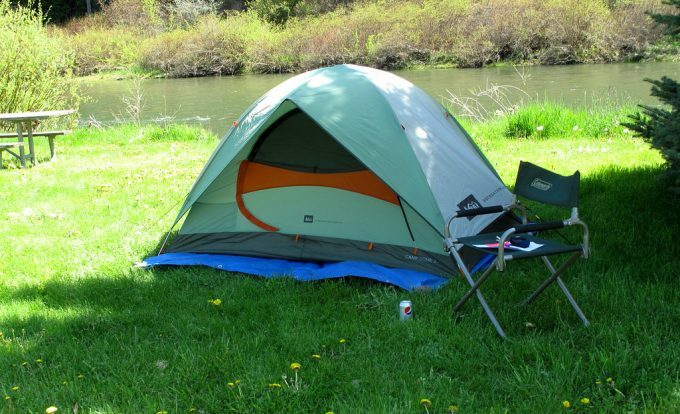 If you set up your tent incorrectly, some of its parts can damage each other. For example, a poorly connected pole can tear a hole in the canvas. Therefore, try to assemble your tent at home at least once, so that you can figure out every detail and learn the procedure by heart. A bit of practice may save your day when you are backpacking in the wild. A typical tent has guidelines with loops, which get attached to the ground with guys. However, if you have to set up your tent on the rocks or some other impenetrable surface, it’s best to use model featuring a freestanding ability. Shelters for alpine climbers usually have this option available. Description: This four season tent features A-frame structure and is spacious enough for two campers. With dimensions of 7′ 6″ by 4′ 6″, its floor area measures 31 square feet. At the center, the tent reaches up to 40 inches. A spacious vestibule at the front provides the space for the storage of gear and an additional protection. The construction contains four zippered wall vents and two roof vents, as well as one scoop vestibule vent. Taped seams and protective coating protect this model from rain and snow, while ventilation vents prevent condensation. Thanks to this solution, the tent remains comfortable for all year round. The Eureka Alpenlite Tent design consists of clips, grommet corner attachments, and the main post, and makes it possible to set up the tent very quickly even during the bad weather. Crisscrossing poles help maintain the stability in strong winds. If you look for a reliable, lightweight model, this one should satisfy any backpacker, as it weighs just 9 pounds and 5 ounces. Its interior features a set of pockets and a few gear loops. Its excellent moisture and ventilation control allows a lot of flexibility and custom control. The Eureka Alpenlite 2XT is quite comfortable for one camper, but a bit cramped for a pair with thick winter sleeping bags. Related: For maximum comfort in winter seasons, you will need a sleeping bag to survive the harsh weather. Eureka provides the Eureka Grasshopper Sleeping Bag with an unbeatable insulation. 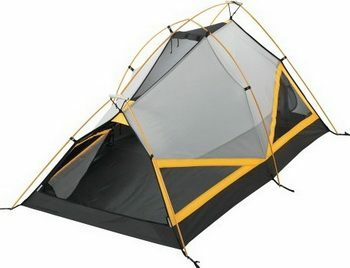 Description: This huge Big Agnes Flying Diamond Tent can become a temporary shelter for 8 people. The model is an excellent solution for a large family or a group of friends who like to spend time together. Featuring 2 spacious rooms and a vestibule, it provides a lot of covered areas for campers to rest or socialize together. The floor covers 112 square feet and the vestibule – 35 square feet. Its height ranges between 54-72 inches. A lower backroom makes an excellent bedroom, while a high main room can fit a small table and a few chairs. A few windows allow for sufficient ventilation, protecting the interior from moisture condensation and ensuring an adequate airflow. The sturdy frame constructed of crisscrossing aluminum poles can withstand strong winds, while the full tough and waterproof fly protect the tent from the rain and snow. An interior contains a lot of convenient pockets and loops for the camping gear. The Big Agnes Flying Diamond tent works best with a matching footprint, which you need to purchase separately. In this tent, a family of four can feel quite comfortable. Related: To protect yourself against the snowy area and to extend the durability of the tent floors, it is better to get the Big Agnes Flying Diamond Footprint. You may add other costs of purchasing the Big Agnes Dream Island Sleeping Bag to survive the extreme weather conditions. Specific features: Freestanding tent to be erected even in impenetrable surfaces, large drop door, 15” integrated awning poles, double wall breathable canopy, full zip waterproof windows, convertible vestibule. Description: This yellow tent is suitable for a pair of campers. Sierra Designs Convert Tent construction features a few unusual technical solutions that should help backpackers in different situations in the wild. This model is freestanding, so you don’t have to attach any parts to the ground. Thanks to this feature you can use the tent on hard surfaces such as rocks or concrete. It’s easy and fast to pitch. It is furthermore lightweight with a total mass of just 5 pounds 2 ounces. Backpackers, who seek to carry the lightest weight possible, can leave the vestibule behind as it’s optional. This tent’s interior area is 31.7 square feet and the vestibule adds 12.4 square feet to the package. The broad door can fit two people at once. The design of an entrance includes two integrated awning poles, which ensure a sufficient opening and drip lines. 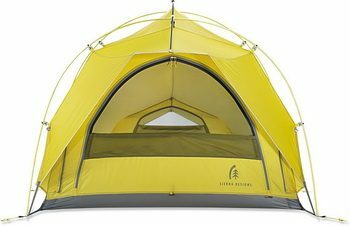 This Sierra tent consists of double walls made of breathable material. Such a solution helps to isolate the interior while maintaining constant temperature indoors, as well as providing effective ventilation. Windows on the front and back of canvas can be fully zipped. If you want to use a floor pad, purchase it separately. Related: For the sleeping pad to withstand the freezing surfaces, we recommend the OutdoorsmanLab Ultralight Sleeping Pad. Also important is the sleeping bag. We recommend the Sierra Designs DriDown Sleeping Bag to survive the cold weather conditions. Specific features: 2 persons for 4-season camping needs, condensation curtain prevents accumulation of frost, rear window for ventilation or star gazing at night, floor area is 28 square feet in size, sturdy DAC Featherlite poles. 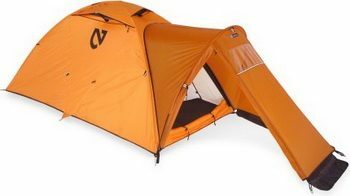 Description: This freestanding orange lightweight tent weighs just 6.2 pounds and can fit two campers inside. The compact model has been designed specifically for mountain climbers and alpine adventurers. This Nemo Tenshi Tent prevents any buildup of frost as it isolates respiration with its condensation curtain. A window on the back wall connects campers to the outside world. The inside space covers 28 square feet of floor and vestibule measures 11 square feet. At the top point, this tent reaches up to 45 inches. The system is well ventilated and constructed from durable materials. This design allows for secure attachment of the tent to the mountain wall while maintaining an airtight entrance. If you are looking for the best tent to take for an alpine trip, the Nemo Tenshi is worthy of your consideration. However, if you need a quality 4-season tent to camp in less extreme conditions, go for a cheaper and more flexible design. Related: Not only is Nemo renowned with the camping tents, but synthetic sleeping bags as well. It has a range of sleeping bags with an unbeatable insulation and a fierce competition to the Down insulation such as the Nemo Symphony Sleeping Bag. Description: This red single-skin tent for two people has been designed for mountain climbers and polar adventurers. 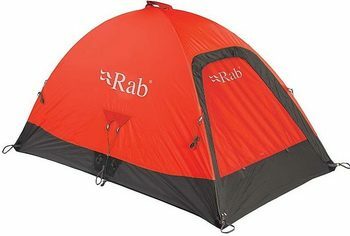 This Rab Latok Tent features a single door with vent. The construction material is durable and waterproof, selected to function well in the extreme environment. This freestanding tent can handle low temperatures, a lot of snow and strong winds. The vestibule is optional and can be attached to the main dome. Seams are taped to maintain warmth inside. 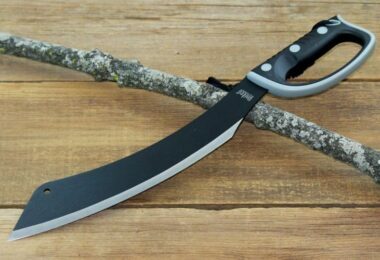 It’s quite lightweight as it weighs just 4 pounds 1 ounce. This set includes internal poles. The construction features donut loops on the sides and the top, as a durable nylon base isolates it from the ground. This model is excellent for a mountain climbing trip, serving as a base tent. People who prefer to go backpacking in the less hostile environment should select cheaper and more spacious model. Optional vestibule to be attached to the main dome. This helps save weight when the vestibule is optional. Related: Women may find this Rab Neutrino 400 Sleeping Bag suitable for them. It is pink in color and has contours that reflect a woman’s body. Moreover, it is insulated to survive the extreme climatic conditions. Description: This large yellow tent is big enough for three campers. Its sturdy geodesic dome can withstand gusts of wind and rain, as well as a thick layer of snow. Eureka K-2 XT Tent features two vestibules, which isolate the interior from unpleasant weather conditions and provide an additional space for storing gear. The rear vestibule can be reached from inside. The tent is self-supporting and set on an aluminum frame built from four poles connected with shock cord. The top height of the dome is 48 inches. This model weighs 11 pounds and 6 ounces. A durable, waterproof fabric protects campers from the elements, while numerous adjustable vents supply fresh air and prevent condensation of moisture inside. While this set seems to be fairly heavy for a backpacking tent, it’s great for short trips. When traveling with a companion, you can share the parts of this set, so everyone carries just a bit of the total weight. 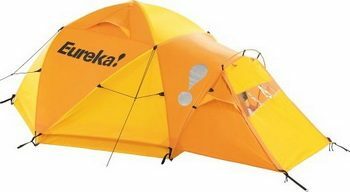 Related: Eureka also offers the sleeping to complement with this camping tent. There is a range of sleeping bags such as the Eureka Azalea Sleeping Bag. 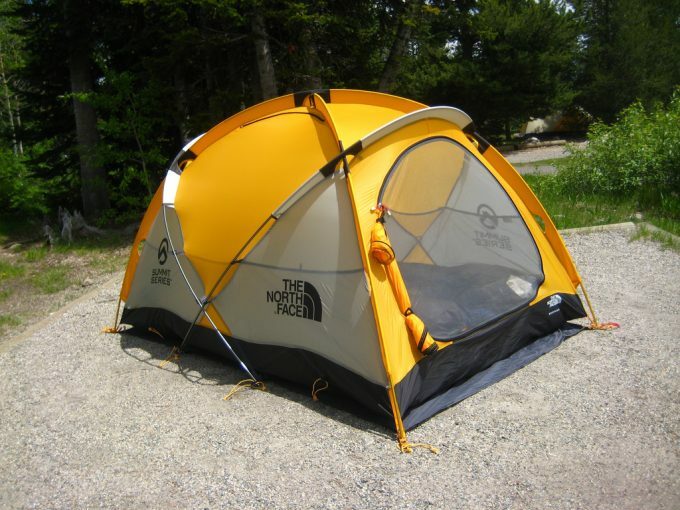 Description: This yellow tent can serve as a shelter for two backpackers. GEERTOP Alpine Tent is designed to serve all year round and can be used for alpine trips as well. The dome from sturdy silicon-coated nylon is fully waterproof and very light. A breathable material provides fresh air indoors, while a thick mesh, attached to the main layer from inside, helps keep warmth in the dome. The sheets have been double-stitched and protected with tape to make all the structure resistant to water. The snow skirt serves to isolate this model during winter or high altitude usage. 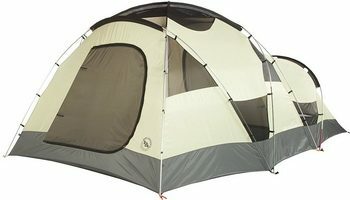 The whole construction with sturdy aluminum poles weighs just 6 pounds, so one person can easily carry this tent alone. This alpine tent is 39.37 inches high at the top. While it’s a bit small for two tall campers, one person will find a lot of space for sleeping inside. Unlike most of the Alpine tent models, this tent features a vestibule so people can store some gear inside as well. While this model serves well during low outdoor temperatures, for two sleepers its ventilation is insufficient and water condensation can take place inside. Related: To survive the freezing surfaces, we recommend getting the Klymit Static V Sleeping Pad as well as the GEERTOP Ultralight Footprint . Descriptions: This colorful tent named after the northern Swedish lake can fit three persons inside its spacious dome. Hilleberg Kaitum Tent has unusual design features two pair of doors and two vestibules. This solution guarantees a lot of space, while still maintaining a reasonable weight of the complete set. An additional space makes the storage of the backpacking gear possible. It can serve as a food preparation area as well. If the weather is hostile, campers can fold back the front part of a detached vestibule, creating a compact, cozy tent instead of the original construction. 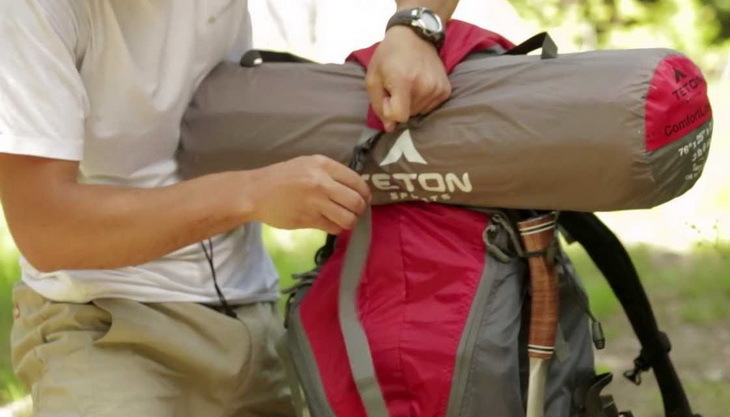 The packaged tent weighs 7,5-8 pounds. That weight is negligible when divided between two or three travelers. While it’s not the most sturdy and lightweight model on the market, it’s comfortable and strong enough to serve as a 4-season tent good enough for camping in the mountains or in the snow. Its small packaged size makes it a popular choice among trekkers, bikers, and ski runners. Related: To extend the durability of your tent and to provide more protection from the snowy grounds, we recommend getting the Hilleberg Nallo Footprint. People who need a sturdy tent which can reliably serve them in any season can find many different models from our list above. We have reviewed the important aspects of the tents to give you more options of selecting the best one. Our table gives you a preview of the features as well as the price of these tents. We have provided you with the important considerations needed before purchasing these tents. We know how perplexing it could be as an amateur to select the best 4-season tent when given a wide range of features. Others cater to the casual backpackers, providing them with spacious and comfortable shelter, which can still withstand unfriendly weather conditions. 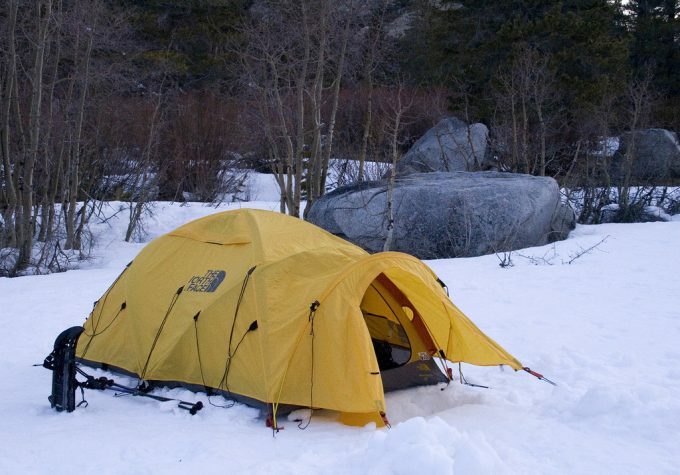 While 4-season tents are usually more expensive than summer ones, they can conserve warmth and withstand winds and thick snowfall much better than most of the classic models.